Major spoiler from last night’s Family Guy (“Life of Brian”) ahead! As I said, he died getting run over by a car, as so many family pets do. Considering he was dodging sharp and shiny weapons with Stewie earlier in the episode, having spent the first act traveling through time and trying to undo a pretty drastic alteration Stewie made to history, it seems all the more ridiculous that his demise could be due to such ordinary circumstances. And after a sad farewell and a funeral, the episode moved on to Brian’s replacement, Vinnie, a a wise Italian-American dog with evident grief counseling abilities. 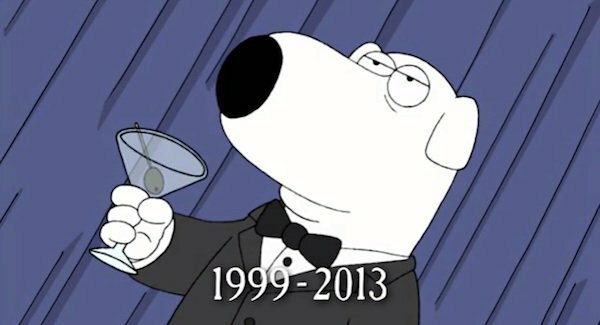 It’s kind of impossible to imagine Family Guy without Brian, as the talking dog has always been a huge presence in the long-running Fox animated series. Whether he was traveling through time with Stewie, hanging out with Peter or crushing on Lois, Brian has been a part of the Griffin family forever. Or for fourteen years, technically. His departure, assuming its as permanent as it seems, feels like a major turning point for the series. Of course, there’s always the possibility that Stewie might be able to figure out a way to get his hands on some capacitors so he can build a new time machine and bring Brian back somehow. In the meantime, RIP Brian. You will be missed. Remember when Brian and Stewie went to the Emmys?